Hey friends. Just wanted to pop in to let you know that I haven't fallen off of the face of the earth. I'm fighting off some kind of yuck sickness. No bueno when you have a four week old and an eighteen month old! After a two hour nap yesterday (which is huge for me, I NEVER nap!) and about eight hours of sleep last night (not straight, of course, I have to get up to nurse Little June), I am feeling better today. Hopefully I'm back to the land of the living and feeling 100% ASAP. I know I promised you guys a big reveal of Little Lady June's nursery this week and I promise that is still coming your way before the end of the week! Also, for those of you who have been sending me your Tuesday at Ten June submissions- I've got them and will be sharing your awesome projects next week. Keep sending me your great projects, folks! Off to chug some water and Vitamin C packs...! Hope you feel better soon. Can't wait to see LLJ's room. I know her nursery will be just gorgeous so can't wait to see it. Take care and be all better soon! Rest up mama!! The blog can wait! 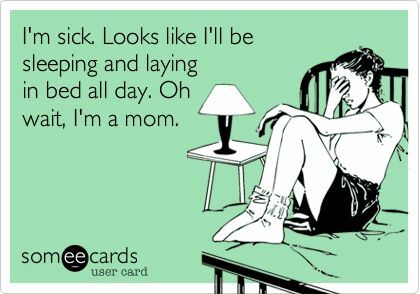 And yeah, no sick days when you're at home. When I worked that was the one thing I looked forward to was taking a legitimate sick day. Like send the kids to daycare and stay in bed a llll day. Doesn't happen anymore! I've been fighting off a cold for the last week too...ugh! Feel better soon! Feel better Michelle! And don't put so much pressure on yourself...take it easy, get some rest (at least try!) and show us Little Lady June's beautiful room when you feel back to your normal self. Take good care and feel better soon. Hope you feel better soon! That cartoon is so accurate when you are a mom! Take care!